Estremoz is roughly in the centre of Portugal, directly east of Lisbon. Set high above the town is a 14th century castle built by the King of Portugal for his wife, Queen Isabel. Because of its position, this made Estremoz quite a stronghold during the 15th century. The room where Queen Isabella died was turned into a chapel in her memory, and today is open to the public. The paintings on the walls of the chapel depict scenes from her life, and tell the story of the Miracle of the Roses. The legend goes, the King did not approve of his wife giving bread to the poor, and so she used to hide the bread in the folds of her skirt. One day he became very suspicious and insisted on seeing what she was hiding and, the very moment she opened up the folds in her skirt, the bread immediately turned into roses. This part of Portugal was rich in marble, and so even the smallest of houses has a look of affluence. Every Saturday in the lower part of town, one of the biggest markets in Portugal takes place in the market square. It is famous for its local earthenware pottery and cheese. During your stay there are a number of different activities that you can take part in as well, such as hiking, cycling, and hunting. However, there also many charming villages and towns to explore that are all within easy reach. Borba is one such town. Once again, most of the houses are made of white marble, and it has many interesting antique shops too if you are looking for something unique. It is also where one of the finest wines in the country is produced. The Borba grape is also the Spanish name of the grape variety grown in the region of Extremedaura in Spain. Less than 20km away is Vila Vicosa, a stunning town decorated in marble with peaceful streets lined with orange and lemon trees. This was the last royal residence of the Braganca family, which was disposed in 1910. It was also the birthplace of Catherine of Braganca, who later became the Queen of England in 1638, and where King Carlos spent his last night before he was assassinated in Lisbon in 1908. Inside the Paco Ducal are some amazing collections, furniture, suits of armour and weapons, all of which give will you a real sense of the lifestyle the Dukes enjoyed. The entrance to the royal hunting grounds, which covers 5,000 acres, can be entered through a very impressive gate called Knot Gate, with ropes and knots carved in stone. There is a medieval castle nearby which not only has wonderful views of the hunting grounds, but contains a small archaeological museum. Also nearby is the town of Castelo de Vide that dates back to the Romans. This very pretty town had a large Jewish presence during the Middle Ages, and it is here where the oldest Synagogue in the country can be found, although there is only one tiny room left. In the small square below the Jewish Quarter is a covered Renaissance fountain, and there is a spa nearby that supposedly cured a variety of ailments. Down the hill from the Jewish Quarter are wider less steep streets that lead to the area which developed during the 17th and 18th century and has an elegant main square and Baroque style buildings. 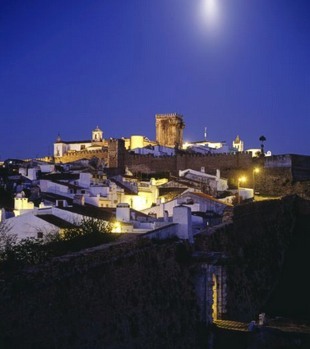 Monsaraz is also worth a visit. This walled village has a fairytale like quality about it and has retained all its medieval charm. Originally fortified by the Knights Templar, there are only 150 residents living there today. The main street is lined with whitewashed houses that lead up to the village’s main square, and within the castle is a unique bullfighting arena where bullfights are held at certain times of the year. If you climb the battlements, you will get a wonderful view of the village and the beautiful countryside. There is just so much to explore in this area, and this is why Estremoz is such an ideal place to base yourself, especially as it has such a superb Pousada to compliment your stay. As mentioned earlier, the Pousada Estremoz (Hotel Rainha Santa Isabel) is located in the castle and is one of the most luxurious of all the Pousadas. Its elegant interior contains the finest period furniture and it has an excellent restaurant serving local and regional cuisine. There are spectacular views of the Alentejo plains, private palace gardens, and a swimming pool. The Pousada can even arrange an 18th century evening on request at certain times of the year.